Clyde Franklin Kluttz (December 12, 1917 – May 12, 1979) was an American professional baseball player, scout and front-office executive. In Major League Baseball, Kluttz was a catcher for the Boston Braves (1942–45), New York Giants (1945–46), St. Louis Cardinals (1946), Pittsburgh Pirates (1947–48), St. Louis Browns (1951) and Washington Senators (1951–52). He threw and batted right-handed, stood 6 feet (1.8 m) tall and weighed 193 pounds (88 kg). Born in nearby Rockwell, he was a longtime resident of Salisbury, North Carolina, where he attended Catawba College. His 17-year playing career began in 1938. In August and September 1952 with Washington, his teammate (and fellow catcher) was George Bradshaw, also a Salisbury native (2010 population: 33,663). Kluttz appeared in 52 regular season games as a member of the 1946 world champion Cardinals—and was the starting catcher on October 3 for the flag-clinching Game 2 of the postseason playoff against the Brooklyn Dodgers  —but he did not play in the 1946 World Series. Rockwell is a town in Rowan County, North Carolina, United States. The population was 2,108 at the 2010 census. Salisbury is a city in the Piedmont of North Carolina; it is the county seat of Rowan County. Located 44 miles northeast of Charlotte and within its metropolitan area, the town has attracted a growing population. This was 33,663 in the 2010 Census. James "Jim" Augustus Hunter, nicknamed "Catfish", was a professional baseball player in Major League Baseball (MLB). From 1965 to 1979, he was a pitcher for the Kansas City Athletics, Oakland Athletics, and New York Yankees. Hunter was the first pitcher since 1915 to win 200 career games by the age of 31. He is often referred to as baseball's first big-money free agent. He was a member of five World Series championship teams. Willie Murphy Crawford was a professional baseball outfielder. He played with the Los Angeles Dodgers (1964–1975), St. Louis Cardinals (1976), Houston Astros (1977) and Oakland Athletics (1977) of Major League Baseball (MLB). Crawford was born in Los Angeles, California. He batted and threw left-handed. He was the father of former UCLA football DB Willie Crawford who graduated from Beverly Hills H.S. in 1988. Paul Rapier Richards was an American professional baseball player, manager, scout and executive in Major League Baseball. During his playing career, he was a catcher and right-handed batter with the Brooklyn Dodgers (1932), New York Giants (1933–35), Philadelphia Athletics (1935) and Detroit Tigers (1943–46). After retiring, he became the manager of the Chicago White Sox and Baltimore Orioles (1955–61). 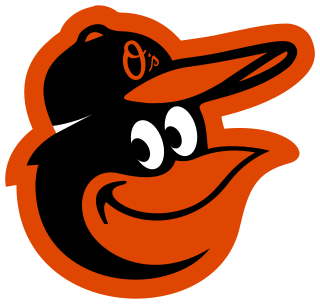 He also served as the General Manager for the Orioles, the Houston Colt .45s and the Atlanta Braves. Preston Rudolph York was a professional baseball player and manager. He played all or part of thirteen seasons in Major League Baseball for the Detroit Tigers, Boston Red Sox (1946–47), Chicago White Sox (1947) and Philadelphia Athletics (1948), primarily as a first baseman. York was born in Ragland, Alabama. He batted and threw right-handed. Richard Alan Sisler was an American player, coach and manager in Major League Baseball. A native of St. Louis, Missouri, he was the son of Hall of Fame first baseman and two-time .400 hitter George Sisler. Younger brother Dave Sisler was a relief pitcher in the 1950s and 1960s with four MLB teams, and older brother George Jr. was a longtime executive in minor league baseball. William Walker Cooper was an American professional baseball player. He was a catcher in Major League Baseball who played for six National League teams from 1940 to 1957. He was known as one of the top catchers in baseball during the 1940s and early 1950s. His elder brother Mort, a right-handed pitcher, was a three-time 20-game winner and three-time NL All-Star. August Rodney Mancuso, nicknamed "Blackie", was an American professional baseball player, coach, scout and radio sports commentator. He played as a catcher in Major League Baseball with the St. Louis Cardinals, New York Giants, Chicago Cubs (1939), Brooklyn Dodgers (1940) and Philadelphia Phillies (1945). Charles Ernest Keller was a left fielder in Major League Baseball. 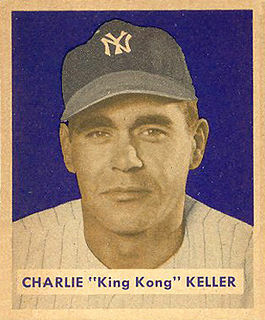 From 1939 through 1952, Keller played for the New York Yankees and Detroit Tigers (1950–51). A native of Middletown, Maryland, he batted left-handed and threw right-handed. His ability to hit massive wall reaching fly balls, and home runs, earned him the nickname "King Kong". Virgil Lawrence "Spud" Davis was an American professional baseball player, coach, scout and manager. He played in Major League Baseball as a catcher for the St. Louis Cardinals, Philadelphia Phillies, Cincinnati Reds, and Pittsburgh Pirates. Davis' .308 career batting average ranks fourth all-time among major league catchers. John Lester Moss was an American professional baseball player, coach, scout and manager. He played in Major League Baseball as a catcher for the St. Louis Browns for the most significant portion of his career, and was a backup catcher almost all his career. James Wren "Zack" Taylor was an American professional baseball player, coach, scout and manager. He played in Major League Baseball as a catcher with the Brooklyn Robins, Boston Braves, New York Giants, Chicago Cubs, New York Yankees, and again with the Brooklyn Dodgers. Although Taylor was not a powerful hitter, he sustained a lengthy career in the major leagues due to his valuable defensive abilities as a catcher. 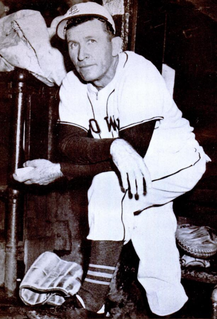 After his playing career, he became better known as the manager for the St. Louis Browns owned by Bill Veeck. His baseball career spanned 58 years. Thomas Leroy Wilson is a former professional baseball player. He played all or part of four seasons in Major League Baseball, primarily as a catcher. 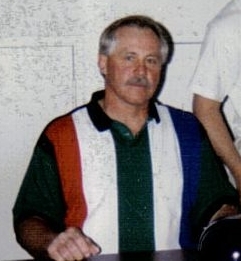 Barry Clifton Foote is an American former professional baseball player, scout, coach and minor league manager. Foote played in Major League Baseball as a catcher for the Montreal Expos (1973–1977), Philadelphia Phillies (1977–1978), Chicago Cubs (1979–1981), and New York Yankees (1981–1982). He played most of his baseball career as a back-up catcher. Louis Klopsche Finney was an American professional baseball player. He spent fifteen seasons in Major League Baseball (MLB) playing for the Philadelphia Athletics, Boston Red Sox, St. Louis Browns (1945–46), and Philadelphia Phillies (1947) as an outfielder and first baseman. John Clement Schulte was an American catcher and longtime coach in professional baseball. A native of Fredericktown, Missouri, Schulte batted left-handed, threw right-handed and was listed as 5 feet 11 inches (1.80 m) tall and 190 pounds (86 kg). Don Wilson Padgett was an American professional baseball player, a catcher/outfielder for the St. Louis Cardinals (1937–41), Brooklyn Dodgers (1946), Boston Braves (1946) and Philadelphia Phillies (1947–48). Padgett, born in Caroleen, North Carolina, batted left-handed, threw right-handed, stood 6 feet (1.8 m) tall and weighed 190 pounds (86 kg). He attended Lenoir-Rhyne College. Edward Joseph Onslow was a first baseman in American Major League Baseball who played for the Detroit Tigers (1912–13), Cleveland Indians (1918) and Washington Senators (1927). Born in Meadville, Pennsylvania, he was the younger brother of Jack Onslow, a catcher, coach and scout in the major leagues, and the manager of the 1949–50 Chicago White Sox. Delbert Quentin Wilber, was an American professional baseball player, manager, coach and scout. A catcher, he appeared in 299 Major League games for the St. Louis Cardinals (1946–49), Philadelphia Phillies (1951–52) and Boston Red Sox (1952–54). The native of Lincoln Park, Michigan, threw and batted right-handed. He stood 6 feet 3 inches (1.91 m) tall and weighed 200 pounds (91 kg). Vernon Adair Benson was an infielder/outfielder, coach, scout and interim manager in American Major League Baseball. During his playing career, he stood 5'11" (180 cm) tall, weighed 180 pounds (82 kg), batted left-handed, and threw right-handed. Alfred Hubert Evans was an American Major League Baseball catcher and a Minor League manager. Listed at 5 ft 11 in (1.80 m), 190 lb., Evans batted and threw right-handed. He was born in Kenly, North Carolina. Clarence James "Bubber" Jonnard was a Major League Baseball catcher. He played for the Chicago White Sox in 1920, the Pittsburgh Pirates in 1922, the Philadelphia Phillies in 1926, 1927 and 1935, and the St. Louis Cardinals in 1929. He played 103 Major League games with 235 at bats, 54 hits, no home runs and 20 RBIs. His lifetime batting average was .230, with a .267 on-base percentage and a .268 slugging percentage. 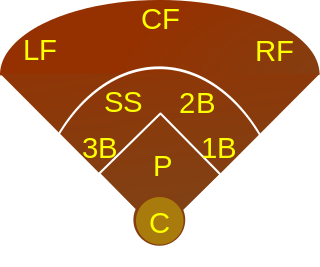 As a fielder, he caught 86 games with a fielding percentage of .960. On December 13, 1927, he was part of a trade in which the Phillies received pitcher Jimmy Ring and catcher Johnny Schulte from the Cardinals in exchange for Jonnard, infielder Jimmy Cooney and outfielder Johnny Mokan. He served as a coach for the New York Giants from 1942 to 1946. He also served as a scout for the Giants, Kansas City Athletics, Baltimore Orioles and New York Mets. Players he signed as Mets' scout included Ed Kranepool, Nino Espinosa, Mike Jorgensen, Ken Singleton and Leroy Stanton.